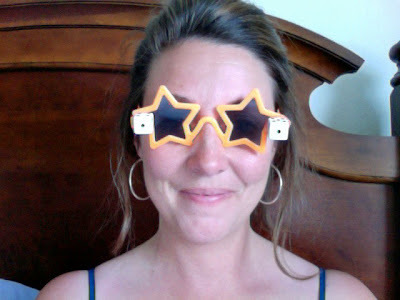 Life at 7000 feet: Let the good times (and the randomness) roll! Let the good times (and the randomness) roll! I won these fun glasses at Bunco the other night. Aren't they awesome? 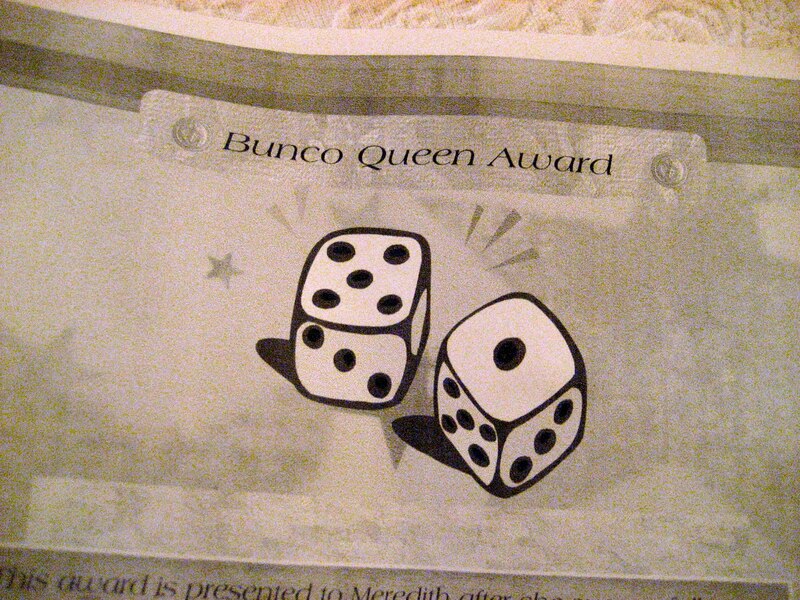 Evidently, I'm the Bunco queen because I've won "Most Buncos" and big money the last two months. My sweet friend Tiffany hosted our third neighborhood Buncoversary last week. She gave out hilarious awards and prizes to everyone and I don't think I've laughed that hard in a long time. See my award? I really am the Bunco Queen. Do you play Bunco? Isn't it such mindless fun? Friday evening we were watching ABCNews. We love Diane Sawyer and we're loyal to ABCNews, but I really think it's because we enjoy their Person of the Week segment. Know who their person of the week was last week? Harper Lee, author of To Kill A Mockingbird which was published FIFTY years ago. Have you seen any of the anniversary hype? 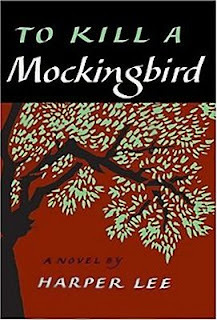 I can't remember how old I was when I first read it, but I remember being engrossed from beginning to end. It's a brilliant book. A timeless classic. Imagine my surprise and joy when Sarah asked us the next day to find our copy for her to read. John pulled it out for her and she's been reading away...and giving me running commentary as she goes. I LOVE it! John and I were sitting outside reading and drinking coffee yesterday morning before the kids were up. Sarah woke up first, saw us outside, grabbed To Kill A Mockingbird, and joined us. Swoon. Speaking of classics, we introduced our kids to Field of Dreams last week. Such a good movie. We'd forgotten how much we loved it. I thought it was so cool that Katrina's 10-on-the-10th list was a recap of her visit to the Field of Dreams movie site! This picture that Abbey drew just makes me smile. It's been on our refrigerator for awhile but I'm not ready to take it down. Check out John's hair, Will's (pink) shirt, and Jack's tail. Cute, cute, cute! I had a little taste of what it feels like to send our teenager "out with friends" over the weekend. Can't say I loved it. I pretty much worried the entire time he was gone. He went out for burgers with some of his Wyldlife friends and their VERY responsible leader(s) but I didn't really relax until he was home. This growing up and letting them go stuff is hard for me. We coached Will before he left on how to calculate a tip at the restaurant because he's never gone to a sit-down place without us. I bit my tongue when he texted me that they were walking around the mall for a bit after dinner. And again when he told me they were getting drinks at Sonic. I trusted the leader he was with but it's just really, really hard for me to lengthen my mom-tether. Maybe it's good that we have a son to start this process with. I have a feeling it might feel even harder with the girls. So thankful for cell phones though! Oh! Oh! Oh! My leg and hip are SO much better. I haven't taken ibuprofen in days! I have very little pain anymore and have resumed most of my normal activity. I don't think I'll be running again (for awhile)(maybe EVER)(who am I kidding?!?) My therapist told me if decide I want to run again she'd like to teach me how. Evidently I have bad mechanics and she doesn't want me to re-injure myself. I don't care to re-learn right now, but I'll probably let her teach me at some point because honestly? Walking is so boring to me. I usually end up running just to get a workout over with sooner. But I'm not in a hurry for ANY of that just yet. Trust me. I'm super, super cautious these days. Some dear friends sent us a FUN package last week that really blessed us. There was something special for everyone in it, and this is what she sent me! Isn't it cute? It's a cinch bag with back straps and I immediately threw my wallet, lipstick, and my camera in it and have taken it everywhere I've gone since. Thank you, NTH, I LOVE it! You blessed our family in a HUGE way. We love you! Be on the lookout for something to land in YOUR mailbox this week. Alright. Gotta get movin'. Tomorrow we'll be celebrating all things Sarah and I've got a long to-do list to get ready for her 12th birthday party! Peace out, peeps! I've been following your blog for a while but don't think I've ever commented...I enjoy your writing! You should frame that picture! I've framed a few family pictures that my oldest has drawn (my youngest is too young to draw) and love to see how the portraits have changed over the years:). LOVE Bunco and I LOVE your glasses!!! I NEVER win . . . I mean like EVER! Playing tomorrow night. . . maybe then will be my night?!? The whole letting go thing is tough for me too! You described me to a "T" how I would have been if it were Alec going out. SO, SO, SO glad your pain is gone. You need some running shoes like mine. . . seriously. . . you know that show "The Doctors"? They were all wearing them one day talking about how good they are b/c you are forced to run biomechanically correct. . . just a little food for though for you! WOW! I feel blessed that you have "linked" up my Field of Dreams trivia to your blog! I love that your daughter loves to read. Love the creativity in the picture. I'm sure that for me "letting go" will be difficult too. I'm sure he was a well behaved young man and LOVED being out without any of his family! Also YEAH about your leg/hip feeling wonderful!!! I tell you, half of me LOVES this teenagehood stuff and half of me still squirms as I let my son do things that just aren't that comfortable. He's on the countdown now, eligible to get a permit in November. (which, if you're counting is in 4 months!) In our house, we've decided that's a guideline, and that character actually defines at what age any of them will do anything. It's a really hard, hard thing to watch them swim out deeper and deeper, isn't it? I like the idea of that tether... gives the impression that one can let them go out without releasing them completely to the sharks. I'm so glad your leg is getting better, Mer. I know how much you wanted to enjoy the outdoors this summer. I pray God is using that gift to heal your heart. I love that picture of your family. It looks a lot like something my Natalie would draw. The next time we come to CO, we should get together with our daughters. They would enjoy each other as much as I enjoy you. I'm so so so so so far behind on blog reading. So I am so glad that this is the post that I walked into after my haitus. It just made me smile. I love random posts, and this one was great. I've missed you, Mer! Hope you're enjoying your summer. we used to play bunco and i loved it! the drawing looks amazingly like all of you! Never played but I already know I'm missing out. I haven't heard of ANYONE here who has a group. And there's the work-at-night hubby thing. That first photo? LOVE IT. I totally understand the pain that comes with loosening the mother tether. Sigh. I've been in several bunco groups over the years. I always love the snacks. I wasn't sure how I'd cope when Charlie left but I really have enjoyed Diane as the anchor. She seems so much more real-life than the other stations' anchors to me. 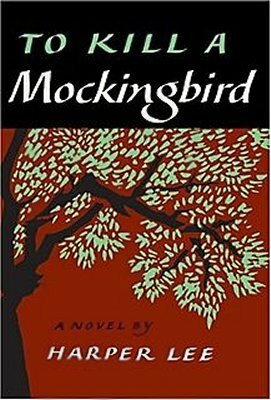 With all the TKAM talk I decided to re-read it only to find to my astonishment that we don't own a single copy of that book! I was sure we did, but I was wrong. I'm going to fix that first chance I get. I love the movie, too. Fun Mom Friday: Watermelon, Anyone? If you live here, they will come.